I went to the back lawn this morning to have a nose around those little tents I stumbled upon the other day and they were gone. There's not a trace of those little folk or their wee campsite (except for a few extra toadstools). As I went to the far back corner of our lot to gather some pinecones I did make another discovery. Another camp site, this one made up of wee-tee-pee's! 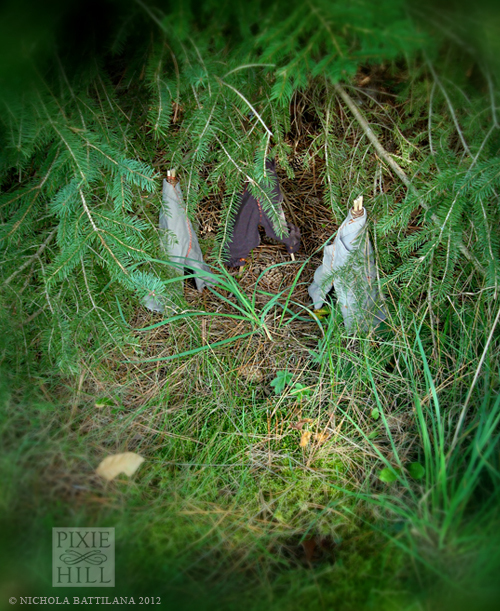 Unlike the last camp these were well hidden from view beneath a large pine tree. I do wonder what they are up to. Discussing dinner plans. A chow-pow-wow.